Resharper is a wonderful tool. I sincerely thank for offering this tool. One of the very few dissatisfaction is "Go To Declaration". 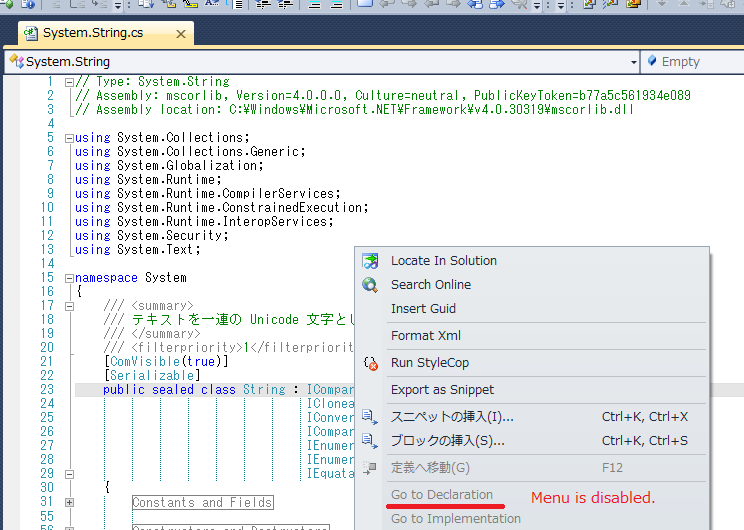 In the default behavior of Visual Studio 2010, I can display declaration in the displayed meta data again. Cannot be done in Resharper. I hope to be able to use "Go To Declaration" feature in the metadata or disassembled code. With ReSharper 5.0 or higher you should be able to navigate to metadata. the displayed meta data again. Cannot be done in Resharper. I am sorry for the reply is slowing. For example, I go to the declaration of System.String. Then, the following codes is displayed. The declaration cannot be seen even if it right-clicks on IComparable in this code. Is there a method of enabling this? I hope it is enabled in default.